Hi parents! Did you still finding activities for your kids during this school holiday? Finding useful activities for children during school holidays is increasingly challenging. With the existence of technologies such as smartphones and tablets, now kids prefer to spend playing online games instead of performing physical activity. For this reason, Chichi & Chacha wants to invite children and parents who are keen to join #CCHappyCamp organized especially for children aged 4 to 8 years. When I informed to my daughter about this Happy Camp she is so excited about it. She loves Chichi and Chacha and when she was still young I had a chance to bring her to Chichi and Chacha studio once. I bet she had a good memory about it and want to meet them again. 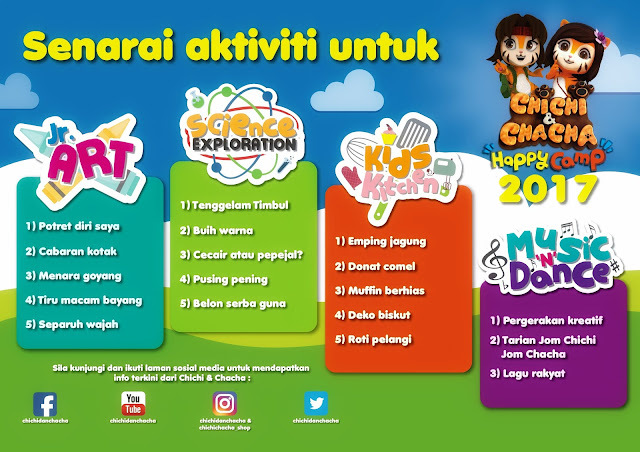 If you still unaware about Chichi and Chacha, Chichi & Chacha is a children's edutainment that plan focusing on early childhood education. Chichi & Chacha, inspired by E2L Sdn Bhd, wants children to recognize their potential. Did you know your kids potential? #CCHappyCamp has three exciting activities that can help and increase the ability of children. The first activity to be held at #CCHappyCamp is the art and craft known as' Jr. Art 'which helps children express their creativity within themselves. The second activity is a healthy food activity or 'Kids Kitchen' where children will learn to produce their own nutritious snacks. In addition, children also have the opportunity to run 'Science Exploration' which will teach them about observation and reasoning. 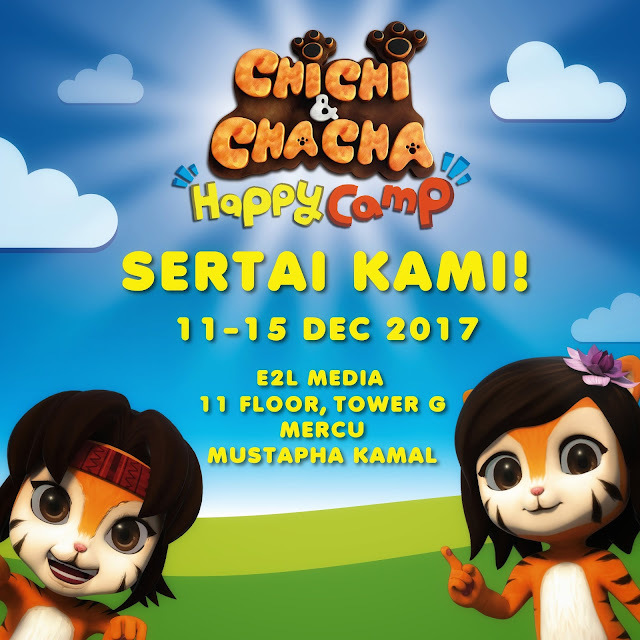 The closest #CCHappyCamp will be held from 11 to 15 December 2017 at Mercu Mustapha Kamal, Damansara Perdana. #CCHappyCamp's participation fee is RM80. Registration has been opened and if you become the first 20 people to register, you will get a special price. So I already register my daughter for the camp and eventhough Fateh is eligible to join the camp but I didn't have enough confident about it yet. Haha..but I will think about it again later. So if you interested to bring your kids to this Happy Camp, you can register at bit.ly/HappyCamp-Form. See you at the Happy Camp! Bagus ada program bermanfaat macam ni di cuti sekolah..